Britain has produced its fair share of screen beauties. Some like Vivien Leigh and Elizabeth Taylor became the very stuff of movie legend. Jean Simmons and Deborah Kerr were at the same time English roses and formidable actresses. Julie Christie was an icon of the Swinging Sixties. Moving closer to today box offices cherish Catherine Zeta Jones and Kate Beckinsale even if they haven’t always found the scripts to match their talent. Keira Knightley isn’t afraid of a challenge whether the subject is costume drama, bounty hunting, or infidelity. In the most recent crop beauty and ability come in the different shapes of Gemma Arterton and Emma Watson. To their number I’d like to add Hazel Court, the flame-haired, emerald-eyed ‘scream queen’ who did her best work for horror movie director Roger Corman in The Raven, The Premature Burial, and above all the The Masque of the Red Death. Court’s ample cleavage deserved a screen credit in its own right and back in the 1960s when I was a teenager it was as outrageous as the gory plots in her Edgar Allan Poe-inspired films. 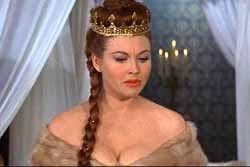 But Court was an established actress before she made her first fantasy movie in the 1950s. Apart from her powerful physical presence, Court brought absolute belief to her roles. Acting opposite super-hams such as Peter Cushing in her work for Hammer and Vincent Price with Corman, any campness on her part would have sunk the movies under the weight of their own knowingness. As it is Masque is Corman’s masterpiece. There is an appealing interview with Court on the Temple of Schlock website. She died in the US at the age of 82 in 2008 having moved to America many years before. In researching these brief words I was pleased to find Court’s obituaries paid proper respect to her place in movie history and that a personal reminiscence remembered her with great affection for a life well spent.